Argon is a chemical element with symbol Ar and atomic number 18. It is in group 18 of the periodic table and is a noble gas. Argon is the third most abundant gas in the Earth's atmosphere, at 0.934% (9340 ppmv). It is more than twice as abundant as water vapor (which averages about 4000 ppmv, but varies greatly), 23 times as abundant as carbon dioxide (400 ppmv), and more than 500 times as abundant as neon (18 ppmv). Argon is the most abundant noble gas in Earth's crust, comprising 0.00015% of the crust. Nearly all of the argon in Earth's atmosphere is radiogenic argon-40, derived from the decay of potassium-40 in the Earth's crust. In the universe, argon-36 is by far the most common argon isotope, being the preferred argon isotope produced by stellar nucleosynthesis in supernovas. The name "argon" is derived from the Greek word ἀργόν, neuter singular form of ἀργός meaning "lazy" or "inactive", as a reference to the fact that the element undergoes almost no chemical reactions. The complete octet (eight electrons) in the outer atomic shell makes argon stable and resistant to bonding with other elements. Its triple point temperature of 83.8058 K is a defining fixed point in the International Temperature Scale of 1990. Argon is produced industrially by the fractional distillation of liquid air. Argon is mostly used as an inert shielding gas in welding and other high-temperature industrial processes where ordinarily unreactive substances become reactive; for example, an argon atmosphere is used in graphite electric furnaces to prevent the graphite from burning. Argon is also used in incandescent, fluorescent lighting, and other gas-discharge tubes. Argon makes a distinctive blue-green gas laser. Argon is also used in fluorescent glow starters. Argon has approximately the same solubility in water as oxygen and is 2.5 times more soluble in water than nitrogen. Argon is colorless, odorless, nonflammable and nontoxic as a solid, liquid, and gas. Argon is chemically inert under most conditions and forms no confirmed stable compounds at room temperature. , and excited-state complexes, such as ArF, have been demonstrated. Theoretical calculation predicts several more argon compounds that should be stable but have not yet been synthesized. Argon (Greek: ’αργόν, neuter singular form of ’αργός, meaning "inactive", in reference to its chemical inactivity) was suspected to be a component of air by Henry Cavendish in 1785. Argon was first isolated from air 1894 by Lord Rayleigh and Sir William Ramsay at University College London by removing oxygen, carbon dioxide, water, and nitrogen from a sample of clean air. They had determined that nitrogen produced from chemical compounds was 0.5% lighter than nitrogen from the atmosphere. The difference was slight, but it was important enough to attract their attention for many months. They concluded that there was another gas in the air mixed in with the nitrogen. Argon was also encountered in 1882 through independent research of H. F. Newall and W. N. Hartley. Each observed new lines in the color spectrum[clarify] of air that did not match known elements. Argon was the first noble gas to be discovered. Until 1957, the symbol for argon was "A", but now is "Ar". Argon constitutes 0.934% by volume and 1.288% by mass of the Earth's atmosphere, and air is the primary industrial source of purified argon products. Argon is isolated from air by fractionation, most commonly by cryogenic fractional distillation, a process that also produces purified nitrogen, oxygen, neon, krypton and xenon. The Earth's crust and seawater contain 1.2 ppm and 0.45 ppm of argon, respectively. Ca (88.8%) by beta decay. These properties and ratios are used to determine the age of rocks by K–Ar dating. Ca followed by an alpha particle emission as a result of subsurface nuclear explosions. It has a half-life of 35 days. Ar in Earth's atmosphere, which is only 31.5 ppmv (= 9340 ppmv × 0.337%), comparable with that of neon (18.18 ppmv) on Earth and with interplanetary gasses, measured by probes. Ar, and its content may be as high as 1.93% (Mars). Ar is the reason the standard atomic weight of terrestrial argon is greater than that of the next element, potassium, a fact that was puzzling when argon was discovered. Mendeleev positioned the elements on his periodic table in order of atomic weight, but the inertness of argon suggested a placement before the reactive alkali metal. Henry Moseley later solved this problem by showing that the periodic table is actually arranged in order of atomic number (see History of the periodic table). 2 dication, which is valence-isoelectronic with carbonyl fluoride and phosgene, was observed in 2010. Argon-36, in the form of argon hydride (argonium) ions, has been detected in interstellar medium associated with the Crab Nebula supernova; this was the first noble-gas molecule detected in outer space. Solid argon hydride (Ar(H2)2) has the same crystal structure as the MgZn2 Laves phase. It forms at pressures between 4.3 and 220 GPa, though Raman measurements suggest that the H2 molecules in Ar(H2)2 dissociate above 175 GPa. Argon is produced industrially by the fractional distillation of liquid air in a cryogenic air separation unit; a process that separates liquid nitrogen, which boils at 77.3 K, from argon, which boils at 87.3 K, and liquid oxygen, which boils at 90.2 K. About 700,000 tonnes of argon are produced worldwide every year. 40Ar, the most abundant isotope of argon, is produced by the decay of 40K with a half-life of 1.25×109 years by electron capture or positron emission. Because of this, it is used in potassium–argon dating to determine the age of rocks. Argon is a chemically inert gas. Argon is the cheapest alternative when nitrogen is not sufficiently inert. Argon has low thermal conductivity. Argon has electronic properties (ionization and/or the emission spectrum) desirable for some applications. Other noble gases would be equally suitable for most of these applications, but argon is by far the cheapest. Argon is inexpensive, since it occurs naturally in air and is readily obtained as a byproduct of cryogenic air separation in the production of liquid oxygen and liquid nitrogen: the primary constituents of air are used on a large industrial scale. The other noble gases (except helium) are produced this way as well, but argon is the most plentiful by far. The bulk of argon applications arise simply because it is inert and relatively cheap. Argon is used in some high-temperature industrial processes where ordinarily non-reactive substances become reactive. For example, an argon atmosphere is used in graphite electric furnaces to prevent the graphite from burning. For some of these processes, the presence of nitrogen or oxygen gases might cause defects within the material. Argon is used in some types of arc welding such as gas metal arc welding and gas tungsten arc welding, as well as in the processing of titanium and other reactive elements. An argon atmosphere is also used for growing crystals of silicon and germanium. Argon is used in the poultry industry to asphyxiate birds, either for mass culling following disease outbreaks, or as a means of slaughter more humane than the electric bath. Argon is denser than air and displaces oxygen close to the ground during gassing. Its non-reactive nature makes it suitable in a food product, and since it replaces oxygen within the dead bird, argon also enhances shelf life. Argon is sometimes used for extinguishing fires where valuable equipment may be damaged by water or foam. Ar contamination. Dark-matter detectors currently operating with liquid argon include DarkSide, WArP, ArDM, microCLEAN and DEAP. Neutrino experiments include ICARUS and MicroBooNE, both of which use high purity liquid argon in a time projection chamber for fine grained three-dimensional imaging of neutrino interactions. Argon is used to displace oxygen- and moisture-containing air in packaging material to extend the shelf-lives of the contents (argon has the European food additive code E938). Aerial oxidation, hydrolysis, and other chemical reactions that degrade the products are retarded or prevented entirely. High-purity chemicals and pharmaceuticals are sometimes packed and sealed in argon. In winemaking, argon is used in a variety of activities to provide a barrier against oxygen at the liquid surface, which can spoil wine by fueling both microbial metabolism (as with acetic acid bacteria) and standard redox chemistry. Argon is sometimes used as the propellant in aerosol cans for such products as varnish, polyurethane, and paint, and to displace air when preparing a container for storage after opening. Since 2002, the American National Archives stores important national documents such as the Declaration of Independence and the Constitution within argon-filled cases to inhibit their degradation. Argon is preferable to the helium that had been used in the preceding five decades, because helium gas escapes through the intermolecular pores in most containers and must be regularly replaced. Argon may be used as the inert gas within Schlenk lines and gloveboxes. Argon is preferred to less expensive nitrogen in cases where nitrogen may react with the reagents or apparatus. Argon may be used as the carrier gas in gas chromatography and in electrospray ionization mass spectrometry; it is the gas of choice for the plasma used in ICP spectroscopy. 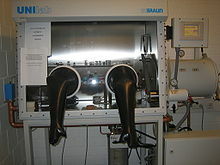 Argon is preferred for the sputter coating of specimens for scanning electron microscopy. Argon gas is also commonly used for sputter deposition of thin films as in microelectronics and for wafer cleaning in microfabrication. Cryosurgery procedures such as cryoablation use liquid argon to destroy tissue such as cancer cells. It is used in a procedure called "argon-enhanced coagulation", a form of argon plasma beam electrosurgery. The procedure carries a risk of producing gas embolism and has resulted in the death of at least one patient. Blue argon lasers are used in surgery to weld arteries, destroy tumors, and correct eye defects. Argon has also been used experimentally to replace nitrogen in the breathing or decompression mix known as Argox, to speed the elimination of dissolved nitrogen from the blood. Incandescent lights are filled with argon, to preserve the filaments at high temperature from oxidation. It is used for the specific way it ionizes and emits light, such as in plasma globes and calorimetry in experimental particle physics. Gas-discharge lamps filled with pure argon provide lilac/violet light; with argon and some mercury, blue light. Argon is also used for blue and green argon-ion lasers. Argon is used for thermal insulation in energy-efficient windows. Argon is also used in technical scuba diving to inflate a dry suit because it is inert and has low thermal conductivity. Argon is used as a propellant in the development of the Variable Specific Impulse Magnetoplasma Rocket (VASIMR). Compressed argon gas is allowed to expand, to cool the seeker heads of the AIM-9 Sidewinder missile and other missiles that use cooled thermal seeker heads. The gas is stored at high pressure. Argon-39, with a half-life of 269 years, has been used for a number of applications, primarily ice core and ground water dating. Also, potassium–argon dating is used to date igneous rocks. Argon has been used by athletes as a doping agent to simulate hypoxic conditions. In 2014, the World Anti-Doping Agency (WADA) added argon and xenon to the list of prohibited substances and methods, although at this time there is no reliable test for abuse. Although argon is non-toxic, it is 38% denser than air and therefore considered a dangerous asphyxiant in closed areas. It is difficult to detect because it is colorless, odorless, and tasteless. A 1994 incident, in which a man was asphyxiated after entering an argon-filled section of oil pipe under construction in Alaska, highlights the dangers of argon tank leakage in confined spaces and emphasizes the need for proper use, storage and handling. Oxygen–argon ratio, a ratio of two physically similar gases, which has importance in various sectors. ^ Jump up to: a b Haynes, William M., ed. (2011). CRC Handbook of Chemistry and Physics (92nd ed.). Boca Raton, FL: CRC Press. p. 4.121. ISBN 1439855110. Jump up ^ Shuen-Chen Hwang, Robert D. Lein, Daniel A. Morgan (2005). "Noble Gases". Kirk Othmer Encyclopedia of Chemical Technology. Wiley. pp. 343–383. doi:10.1002/0471238961.0701190508230114.a01. Jump up ^ Magnetic susceptibility of the elements and inorganic compounds, in Lide, D. R., ed. (2005). CRC Handbook of Chemistry and Physics (86th ed.). Boca Raton (FL): CRC Press. ISBN 0-8493-0486-5. Jump up ^ Weast, Robert (1984). CRC, Handbook of Chemistry and Physics. Boca Raton, Florida: Chemical Rubber Company Publishing. pp. E110. ISBN 0-8493-0464-4. Jump up ^ In older versions of the periodic table, the noble gases were identified as Group VIIIA or as Group 0. See Group (periodic table). Jump up ^ Material Safety Data Sheet Gaseous Argon, Universal Industrial Gases, Inc. Retrieved 14 October 2013. Jump up ^ Leonid Khriachtchev; Mika Pettersson; Nino Runeberg; Jan Lundell; et al. (2000). "A stable argon compound". Nature. 406 (6798): 874–876. doi:10.1038/35022551. PMID 10972285. ^ Jump up to: a b Perkins, S. (26 August 2000). "HArF! Argon's not so noble after all – researchers make argon fluorohydride". Science News. Jump up ^ Belosludov, V. R.; Subbotin, O. S.; Krupskii, D. S.; Prokuda, O. V.; et al. (2006). "Microscopic model of clathrate compounds". Journal of Physics: Conference Series. 29: 1. Bibcode:2006JPhCS..29....1B. doi:10.1088/1742-6596/29/1/001 . Jump up ^ Cohen, A.; Lundell, J.; Gerber, R. B. (2003). "First compounds with argon–carbon and argon–silicon chemical bonds". Journal of Chemical Physics. 119 (13): 6415. Bibcode:2003JChPh.119.6415C. doi:10.1063/1.1613631. Jump up ^ Hiebert, E. N. (1963). "In Noble-Gas Compounds". In Hyman, H. H. Historical Remarks on the Discovery of Argon: The First Noble Gas. University of Chicago Press. pp. 3–20. Jump up ^ Travers, M. W. (1928). The Discovery of the Rare Gases. Edward Arnold & Co. pp. 1–7. Jump up ^ Lord Rayleigh; Ramsay, William (1894–1895). "Argon, a New Constituent of the Atmosphere". Proceedings of the Royal Society. 57 (1): 265–287. doi:10.1098/rspl.1894.0149 . JSTOR 115394. Jump up ^ Lord Rayleigh; Ramsay, William (1895). "VI. Argon: A New Constituent of the Atmosphere". Philosophical Transactions of the Royal Society A. 186: 187. Bibcode:1895RSPTA.186..187R. doi:10.1098/rsta.1895.0006 . JSTOR 90645. Jump up ^ Ramsay, W. (1904). "Nobel Lecture". The Nobel Foundation. Jump up ^ "About Argon, the Inert; The New Element Supposedly Found in the Atmosphere". The New York Times. 3 March 1895. Retrieved 1 February 2009. Jump up ^ Holden, N. E. (12 March 2004). "History of the Origin of the Chemical Elements and Their Discoverers". National Nuclear Data Center. Jump up ^ "Argon (Ar)". Encyclopædia Britannica. Retrieved 14 January 2014. Jump up ^ "Argon, Ar". Etacude.com. Retrieved 8 March 2007. ^ Jump up to: a b c d e Emsley, J. (2001). Nature's Building Blocks. Oxford University Press. pp. 44–45. ISBN 978-0-19-960563-7. ^ Jump up to: a b "40Ar/39Ar dating and errors". Archived from the original on 9 May 2007. Retrieved 7 March 2007. Jump up ^ Lodders, K. (2008). "The solar argon abundance". Astrophysical Journal. 674: 607–611. arXiv:0710.4523 . Bibcode:2008ApJ...674..607L. doi:10.1086/524725. Jump up ^ Cameron, A. G. W. (1973). "Elemental and isotopic abundances of the volatile elements in the outer planets". Space Science Reviews. 14 (3–4): 392–400. Bibcode:1973SSRv...14..392C. doi:10.1007/BF00214750. Jump up ^ Mahaffy, P. R.; Webster, C. R.; Atreya, S. K.; Franz, H.; Wong, M.; Conrad, P. G.; Harpold, D.; Jones, J. J.; Leshin, L. A.; Manning, H.; Owen, T.; Pepin, R. O.; Squyres, S.; Trainer, M.; Kemppinen, O.; Bridges, N.; Johnson, J. R.; Minitti, M.; Cremers, D.; Bell, J. F.; Edgar, L.; Farmer, J.; Godber, A.; Wadhwa, M.; Wellington, D.; McEwan, I.; Newman, C.; Richardson, M.; Charpentier, A.; et al. (2013). "Abundance and Isotopic Composition of Gases in the Martian Atmosphere from the Curiosity Rover". Science. 341 (6143): 263. doi:10.1126/science.1237966. PMID 23869014. Jump up ^ Kean, Sam (2011). "Chemistry Way, Way Below Zero". The Disappearing Spoon. Black Bay Books. Jump up ^ Bartlett, Neil (8 September 2003). "The Noble Gases". Chemical & Engineering News. 81 (36). Jump up ^ Lockyear, JF; Douglas, K; Price, SD; Karwowska, M; et al. (2010). "Generation of the ArCF22+ Dication". Journal of Physical Chemistry Letters. 1: 358. doi:10.1021/jz900274p. Jump up ^ Barlow, M. J.; et al. (2013). "Detection of a Noble Gas Molecular Ion, 36ArH+, in the Crab Nebula". Science. 342 (6164): 1343–1345. arXiv:1312.4843 . Bibcode:2013Sci...342.1343B. doi:10.1126/science.1243582. PMID 24337290. Jump up ^ Quenqua, Douglas (13 December 2013). "Noble Molecules Found in Space". New York Times. Retrieved 13 December 2013. Jump up ^ Kleppe, Annette K.; Amboage, Mónica; Jephcoat, Andrew P. (2014). "New high-pressure van der Waals compound Kr(H2)4 discovered in the krypton-hydrogen binary system". Scientific Reports. 4: 4989. Bibcode:2014NatSR...4E4989K. doi:10.1038/srep04989. Jump up ^ "Periodic Table of Elements: Argon – Ar". Environmentalchemistry.com. Retrieved 12 September 2008. Jump up ^ Fletcher, D. L. "Slaughter Technology" (PDF). Symposium: Recent Advances in Poultry Slaughter Technology. Retrieved 1 January 2010. Jump up ^ Shields, Sara J.; Raj, A. B. M. (2010). "A Critical Review of Electrical Water-Bath Stun Systems for Poultry Slaughter and Recent Developments in Alternative Technologies". Journal of Applied Animal Welfare Science. 13 (4): 281–299. CiteSeerX 10.1.1.680.5115 . doi:10.1080/10888705.2010.507119. ISSN 1088-8705. PMID 20865613. Jump up ^ Fraqueza, M. J.; Barreto, A. S. (2009). "The effect on turkey meat shelf life of modified-atmosphere packaging with an argon mixture". Poultry Science. 88 (9): 1991–1998. doi:10.3382/ps.2008-00239 . ISSN 0032-5791. PMID 19687286. Jump up ^ Su, Joseph Z.; Kim, Andrew K.; Crampton, George P.; Liu, Zhigang (2001). "Fire Suppression with Inert Gas Agents". Journal of Fire Protection Engineering. 11 (2): 72–87. doi:10.1106/X21V-YQKU-PMKP-XGTP. ISSN 1042-3915. Jump up ^ Gastler, Dan; Kearns, Ed; Hime, Andrew; Stonehill, Laura C.; et al. (2012). "Measurement of scintillation efficiency for nuclear recoils in liquid argon". Physical Review C. 85 (6): 065811. arXiv:1004.0373 . Bibcode:2012PhRvC..85f5811G. doi:10.1103/PhysRevC.85.065811. Ar Content in Argon from Underground Sources". Astroparticle Physics. 66 (2015): 53–60. arXiv:1204.6011v1 . doi:10.1016/j.astropartphys.2015.01.002. Jump up ^ Zawalick, Steven Scott "Method for preserving an oxygen sensitive liquid product" U.S. Patent 6,629,402 Issue date: 7 October 2003. Jump up ^ "Schedule for Renovation of the National Archives Building". Retrieved 7 July 2009. Jump up ^ "Fatal Gas Embolism Caused by Overpressurization during Laparoscopic Use of Argon Enhanced Coagulation". MDSR. 24 June 1994. Jump up ^ Pilmanis Andrew A.; Balldin U. I.; Webb James T.; Krause K. M. (2003). "Staged decompression to 3.5 psi using argon–oxygen and 100% oxygen breathing mixtures". Aviation, Space, and Environmental Medicine. 74 (12): 1243–50. PMID 14692466. Jump up ^ "Energy-Efficient Windows". FineHomebuilding.com. Retrieved 1 August 2009. Jump up ^ Nuckols M. L.; Giblo J.; Wood-Putnam J. L. (15–18 September 2008). "Thermal Characteristics of Diving Garments When Using Argon as a Suit Inflation Gas". Proceedings of the Oceans 08 MTS/IEEE Quebec, Canada Meeting. MTS/IEEE. Retrieved 2 March 2009. Jump up ^ "Description of Aim-9 Operation". planken.org. Archived from the original on 22 December 2008. Retrieved 1 February 2009. Jump up ^ "WADA amends Section S.2.1 of 2014 Prohibited List". 31 August 2014. Jump up ^ Alaska FACE Investigation 94AK012 (23 June 1994). "Welder's Helper Asphyxiated in Argon-Inerted Pipe – Alaska (FACE AK-94-012)". State of Alaska Department of Public Health. Retrieved 29 January 2011. Triple point pressure: 69 kPa – Lide, D. R. (2005). "Properties of the Elements and Inorganic Compounds; Melting, boiling, triple, and critical temperatures of the elements". CRC Handbook of Chemistry and Physics (86th ed.). CRC Press. §4. ISBN 0-8493-0486-5.